Life as a training manager is not very easy. While you plan, develop, and implement training programs, you also have the responsibility of ensuring that the training objectives are in line with your organization’s goals. No matter what industry you are in, you need to get the most out of people, thereby contributing to the company’s growth. You also need to have the capability of turning any kind of training challenge into a positive experience. Online training programs can provide an engaging learning experience to corporate employees. Many organizations already have eLearning as part of training program initiatives at their workplace. Probably, your organization too has implemented eLearning courses. Just when you thought you had all your ducks in a row, along comes something to upset your plans. It could be a drastic cut in training budget, or an urgent need to train employees, or dealing with employees who do not have much time to devote for lengthy online training programs. Does this mean you stop rolling out online training programs? Absolutely not! Good training managers will work toward finding a solution. And, that’s exactly what this blog aims to help you do. The solution is already present in the form of rapid eLearning development. Rapid eLearning shows you the way to make training programs fun, easy, and profitable, even on a tight budget. When you don’t spend enough time to make the learning experience enjoyable, how can you expect your learners to spend time taking the training program? Agreed, rapid eLearning development cannot afford the frills and fancies that you would normally associate with an eLearning program where you have enough time for development. But, that does not mean that it takes the fun element out of training. Adding fun to training does not always mean animations. Sometimes, simple text is enough to inject a dose of humor. The Journal of the American Psychological Association, published an article that confirmed that even learners who are not motivated enough are likely to perform better when appropriate humor is used in a training program. As training managers, you could contribute or collate interesting workplace anecdotes that can be used in the rapid eLearning course. You could also include scenarios that employees are likely to encounter at work. Provided it’s relevant to the topic of training, it provides a great start to the training program. When you think of fun in training, most learners tend to associate it with gamification. Rapid eLearning development does not offer the scope to apply complex gaming techniques. But, that need not deter you from applying simple gaming concepts and techniques in your rapid eLearning course. Reward learners with badges, points, and medals as they complete each section of the course or answer questions correctly. Nothing motivates a learner more than positive feedback as they take the assessments included in the online training program. 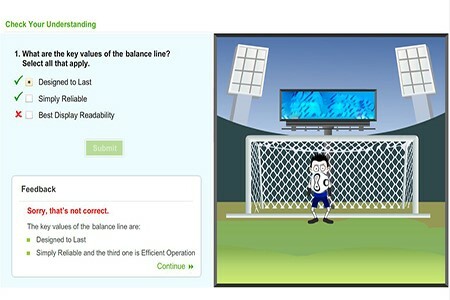 One of our clients wanted to include a course assessment that was designed as a football game. When the learner answered correctly, the ball hits the goal. This is one way of motivating learners to pay attention to the questions and answer them correctly. Assessments are a great strategy to test learners’ knowledge and retention, pre as well as post, the training program. There are instances where clients wish to roll out standalone gamified assessments. 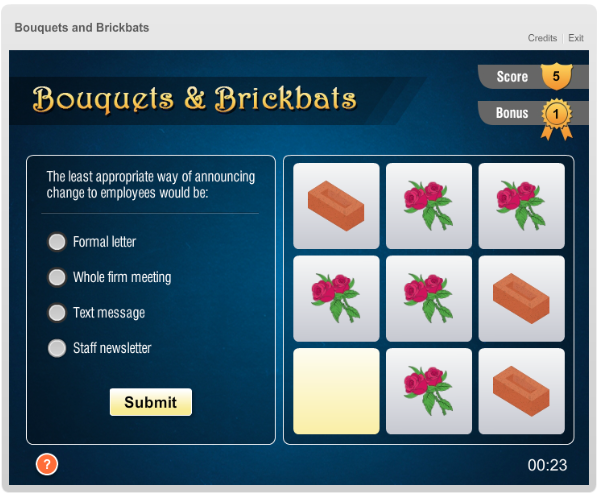 We designed a ‘Bouquets & Brickbats’ game where the learner is awarded a bouquet for the right answer, and a brickbat for the wrong answer. Who wants to receive brickbats? This online assessment had all the learners try their best to receive bouquets. Simple gaming techniques are possible in rapid eLearning development. It often is an excellent strategy to catch learners’ attention and get them started on the eLearning path. Rapid eLearning development offers training managers a quick solution to urgent training needs. It also makes learning easy and effective, and contributes to the success of your training program. In rapid eLearning development, the course is broken down into bite-sized modules. For a learner who is always on-the-go, or does not have enough time to go through a lengthy training program, a short course is a welcome change. Also, when training is imparted through microlearning, the knowledge retention rate increases, with the result that your training program becomes effective. Rapid eLearning development is a great option to try when you want your training program to be short and focused. Even if the eLearning course is devoid of high-end graphics and media elements, if the content is powerful and presented tactically, learners are going to find the training program effective. There may be times when you are required to roll out training programs by a given date, in order to meet a specific business objective. Time is money, and not meeting the schedule can have an adverse impact. For example, a compliance training program has to be rolled out with the latest updates to employees in an organization. Rapid eLearning development can make use of simple scenarios to make the content relevant to the workplace. Not only is there a saving in course development time, but also a saving in the cost of training programs. If you have a PowerPoint deck that contains invaluable information that was earlier used in a classroom training program, you can quickly get it converted to a rapid eLearning course. This is possible with the use of rapid eLearning authoring tools that can be used to quickly add simple interactivities to your existing PowerPoint presentation and get it ready to be rolled out in an online format. And what’s more, this is possible at a reduced cost. With an increase in learner productivity, and reduction in training program costs, rapid eLearning development is a venture that certainly rocks. If you have been thinking of including fun elements in online training, at a reduced cost, then rapid eLearning development is a must try. If you have already implemented rapid eLearning courses in your organization, please do share the experience through the Comments section.